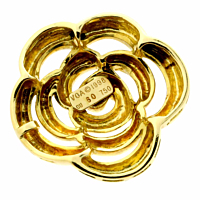 An exceptional vintage gold flower pendant from Van Cleef & Arpels, made in high polished 18kt yellow gold. The open, three dimensional design includes soft edges and fluid movement. A tiny gold namplate lies underneath with the Van Cleef hallmark stamp.